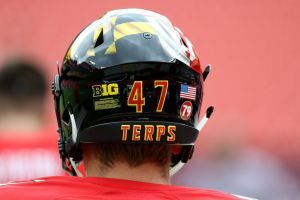 Maryland’s frayed football program turns its attention to a game after a tumultuous week in the midst of a surreal season that seems to have little immediate hope of achieving a sense of normalcy. The external investigation into the death of offensive lineman Jordan McNair; an independent review of the coaching staff, athletic director and school president; and the abbreviated return and firing of head coach DJ Durkin didn’t come close to ending the turmoil surrounding a program with an uncertain future. 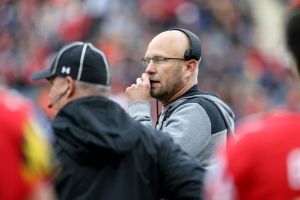 For now, Matt Canada will finish the season as interim coach and offensive coordinator and will guide the team Saturday against Michigan State. Damon Evans will continue as AD and Wallace Loh is slated to remain University president after announcing on Tuesday he will retire in June. — Canada surrendered the reins of the team to Durkin, who was reinstated as head coach Tuesday after being on administrative leave since Aug. 11. — One day later, Durkin was fired . 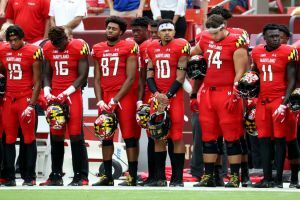 — One day after that, James Brady, chairman of the University System of Maryland board of regents, quit the post after the board received harsh criticism from students, players and state politicians for its decision to reinstate Durkin. 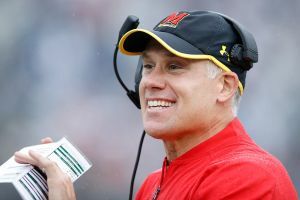 — At practice on Tuesday, during Durkin’s brief return, the team’s disharmony came to a head when a fight between the players broke out. 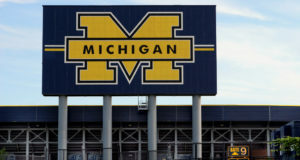 According to the Baltimore Sun, backup punter Matthew Barber, who has criticized the culture of the program, was struck by a teammate who supported Durkin. — The athletic director has said he will investigate the incident. Even with the embarrassing developments, Canada has the Terrapins (5-3, 3-2 Big Ten) one victory away from becoming bowl eligible heading into the matchup with the Spartans (5-3, 3-2). There’s no guarantee Canada will be part of the program if the school decides to clean house and bring in a new coach for 2019, but for now, he’s just trying to keep this fragmented team together. In a season dedicated to McNair, who died of heatstroke in June, the Terrapins have already won more games than last year and are coming off a 63-33 rout of Illinois. 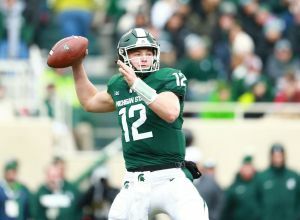 Dantonio has not disclosed his starting quarterback because of the uncertain status of Brian Lewerke. 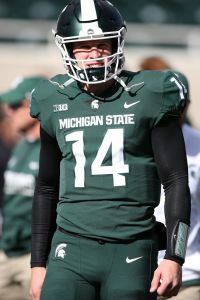 Lewerke had a run of 20 straight starts end last week because of a right shoulder injury he sustained at Penn State on Oct. 13. Freshman Rocky Lombardi stepped in against Purdue and went 26 for 46 for 318 yards and two touchdowns in a 23-13 victory . No matter who starts, the Spartans should be able to move the ball. Ty Johnson stands third on Maryland’s career list with 4,140 all-purpose yards and ranks fourth in rushing with 2,597. He missed the second half of the Illinois game with a calf injury, and his status for Saturday is up in the air. The Terps are deep at running back, however — Anthony McFarland leads the team with 497 yards rushing, and sophomore Javon Leake stepped in last week and rushed for three TDs and got another on a 97-yard kickoff return. Michigan State leads the FBS in rushing defense, so something’s got to give. 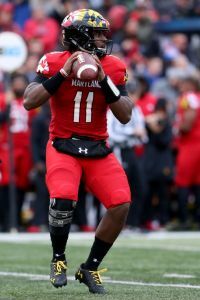 Maryland redshirt freshman quarterback Kasim Hill is coming off the best game of his career, throwing for 265 yards and three TDs against Illinois. So if the Terrapins can’t run, at least there’s another option — if Hill can settle into the pocket, as he did last Saturday. “The offensive line did a great job blocking, I had a bunch of time back there and the receivers were making plays,” Hill said. Michigan State is seeking to become the 27th team in FBS history to win 700 games. 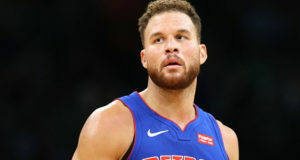 This will be the Spartan’s 1,200th game. They’re 699-456-44.